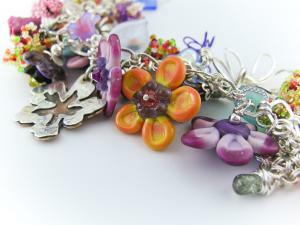 Lush and Loaded Cottage Garden Charm Bracelet waiting to be won. ﻿﻿The Second Annual SATeam Wrist Candy Holiday Giveaway has begun! ﻿﻿﻿﻿The talented members of the Starving Artists team on etsy have collaborated to make a beautiful Flower themed charm bracelet. Our instructions were to create a Flower charm using sterling silver and bright colors. 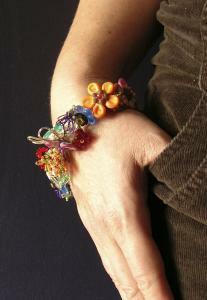 The result is a lush and loaded charm bracelet that looks like a cottage garden. The charms have all been added to a sterling silver charm bracelet and are ready and waiting to be won. The FamiLee Jewels are proud to have one of their charms on this stunning creation. ﻿Shop early and Shop often. 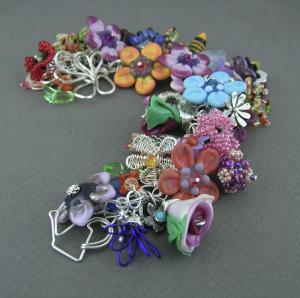 ﻿﻿Between October 17, 2009 and November 28Th, 2010 every time you purchase an item from The FamiLee Jewels or any of the participating etsy stores your name will be entered into the draw to win this beautiful flower-themed bracelet, bursting with with charms hand-made by members of SATeam. The winner will be notified on November 30Th. Stunning, Mom. Which is yours? The silver woven daisy with yellow center that you can see in the last photo.